The foundation of parental guidance and religious education influenced Los Angeles Police Department Captain Jon Peters to become a police officer. “My mom and dad are two amazing individuals that taught myself and my siblings the value of service, giving back, being there for others, hard work and dedication,” he says. That combined with the focus on compassion and social justice issues taught by the Jesuits at Loyola Marymount University set Captain Peters on track to work with people. 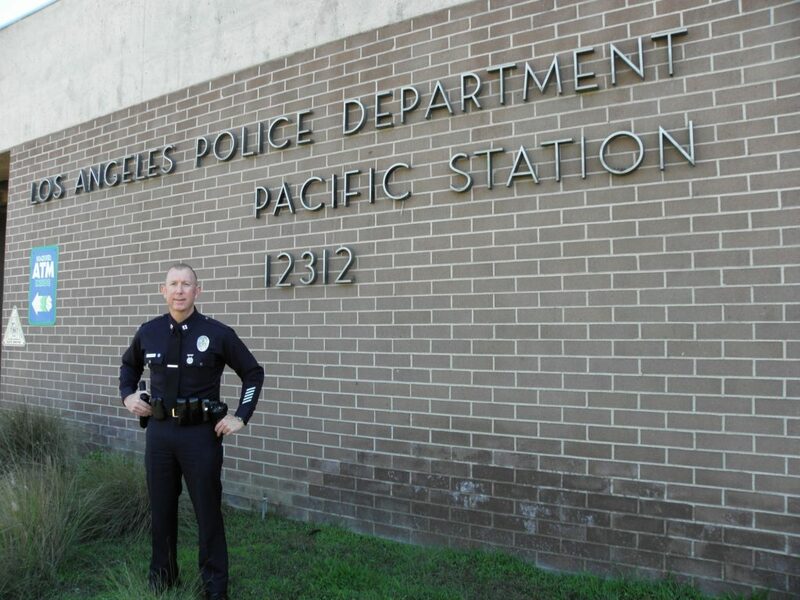 As a young officer Captain Peters started on patrol in South Los Angeles. “I love putting the bad guys in jail,” he says. He had a passion for narcotics enforcement and asked the senior officers how he could be part of the “Major Violators” section of the Narcotics Units that work the big cases. They told him to make detective and that’s exactly what he did. “That was my career path,” he says. Changes aren’t always welcomed but occasionally there is a positive outcome. It was at this time that former Chief Bernard Parks decided it would be a good idea to rotate detectives out of specialized units after one year as part of their training. Captain Peters was in the first group of detectives under the implementation. “I got to my dream job in narcotics and I was rotated out,” he says. The next assignment was at West Valley division working domestic violence cases. “This was nothing I had ever anticipated doing,” he says. But, he learned an incredible amount and really appreciated the experience. He then worked robbery cases where, again, he learned a lot from senior investigators. Captain Peters made sergeant and was transferred to Rampart division. He then went to Van Nuys division as the Officer-In-Charge of the North Hills Task Force, Internal Affairs Group, and as the Aide to the Commanding Officer of Advanced Planning Group. In this position, he performed a dual role planning and coordinating the Department’s hosting of the 2004 International Associate of Chiefs of Police Annual Conference. For his efforts, he was awarded the Los Angeles Police Commission’s Distinguished Service Medal and the Los Angeles County Sheriff’s Department’s Distinguished Service Medal. Captain Peters concluded his time as a sergeant while assigned to the Firearms Training Unit of Training Division. Without intentionally doing so, Captain Peters prepared himself well for being a lieutenant because he was able to offer a candidate who not only had investigative experience as a detective, but, supervisory experience as a sergeant as well as training experience from his time as a police officer in charge of physical training and self defense instruction at the police academy. In the capacity as lieutenant, he worked as a watch commander at Devonshire division and at Pacific for a short time. Captain Peters was then selected to the elite Metropolitan Division where he served as Officer-In-Charge of the Mounted Platoon and as the Assistant Officer-In-Charge of SWAT (Special Weapons and Tactics). He didn’t ride horses when he got the job, but he does now. “That’s the beauty of that program,” he says. “They take somebody like me that has no clue about a horse and, the program is so great, that in five weeks you’re up and riding – and pretty confident. Obviously, there’s a lot that goes into that, but, it’s a really good training program. I’m very proud of that program and the work they do.” He had the unique experience of going through the entire 12-week SWAT training school with new officers who were coming into the unit including the first female who ever made it into SWAT. “The officers are so professional, so committed, so good at what they do,” he says. He also acknowledges that the SWAT perspective puts him in a better position to run incidences, like barricaded suspects, that are part of his duties as captain. Where did Captain Peters go next? Stay tuned for Part II.